Ali al-Marri, once the only designated "enemy combatant" on U.S. soil, has pleaded guilty to a charge of conspiracy to provide material support to al Qaeda, the Justice Department said Thursday. Al-Marri made the surprise plea during a two-hour hearing in a federal courtroom in Peoria, Illinois. He will be sentenced July 30. Under a plea agreement in the case, he faces a sentence of up to 15 years in prison. 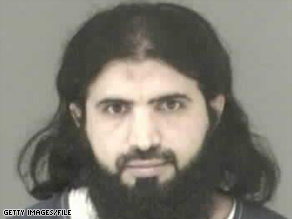 Al-Marri, who was the subject of an intense battle over the legal status of terrorism suspects in U.S. custody, was ordered by the Obama administration to be transferred from military custody in South Carolina to civilian custody to face criminal charges of aiding al Qaeda. A native of Qatar, al-Marri was a student at Bradley University in Peoria when he was arrested in 2001. The Pentagon asserted he trained at a terror camp in Afghanistan, met al Qaeda leaders Osama bin Laden and Khalid Sheikh Mohammed and “volunteered for a martyr mission,” according to court documents filed earlier in his case. According to a copy of his plea agreement, al-Marri admits that he “knowingly conspired and agreed with Khalid Sheikh Mohammed” to provide support to al Qaeda and to work under the organization’s direction and control. “Between 1998 and 2001, the defendant attended various training camps because he wished to engage in jihad,” the document states. While in the training camps and in al Qaeda safe houses in Pakistan, he was known by the name Abdul-Rahman al-Qatari, according to the plea agreement. Mohammed approached al-Marri in 2001, the plea agreement says, about his offer to assist al Qaeda. “The defendant was instructed by Khalid Sheikh Mohammed to enter the United States no later than September 10, 2001, with an understanding that he was to remain in the United States for an undetermined length of time,” the documents said. Al-Marri applied to Bradley using the same e-mail address he used to communicate with Mohammed, the plea agreement says. At Bradley, he “rarely attended classes and was in a failing status by the end of his first semester.” On September 21, 2001, al-Marri traveled to another central Illinois university and created five new e-mail accounts under different aliases, the documents said. “By this time, the defendant knew that al Qaeda was responsible for the September 11, 2001, attacks on the United States and fully understood why Khalid Sheikh Mohammed had directed him to be in the United States before that date.” He used the new e-mail accounts to inform Mohammed of his whereabouts and activities, and also gave him his cell phone number in encoded format, according to the plea agreement. In addition, he conducted online research “related to various cyanide compounds. The defendant’s focus was on various cyanide substances … the defendant reviewed toxicity levels, the locations where these items could be purchased, and specific pricing of the compounds,” the documents said. He also explored obtaining sulfuric acid. An almanac found at al-Marri’s residence was bookmarked “at pages showing dams, waterways and tunnels in the United States,” the plea agreement said. “Ali al-Marri was an al Qaeda ‘sleeper’ operative working on U.S. soil and directed by the chief planner of the 9/11 attacks,” said Arthur Cummings, executive assistant director of the FBI’s National Security Branch, in a Department of Justice statement. “Without a doubt, this case is a grim reminder of the seriousness of the threat we, as a nation, still face,” said Attorney General Eric Holder in the statement. “But it also reflects what we can achieve when we have faith in our criminal justice system and are unwavering in our commitment to the values upon which this nation was founded and the rule of law.” Al-Marri had been held in the Navy brig near Charleston, South Carolina, for more than five years as an “enemy combatant” by the Bush administration. Under the plea agreement, al-Marri waives his right to “oppose his removal from the United States to Qatar or Saudi Arabia, by prisoner transfer, deportation or otherwise,” the documents state. He initially was arrested on credit card fraud charges in December 2001. But his continued confinement without charges mushroomed into a major legal case before federal prosecutors filed charges in February. The Supreme Court ruled on March 6 that al-Marri’s case was rendered moot by a decision to indict him on federal conspiracy charges, and granted the Obama administration’s request to dismiss his challenge of the president’s unilateral authority to detain him indefinitely without charges. He was transferred to civilian custody and taken to Illinois in March. The court’s ruling, however, meant that the larger constitutional issue of the president’s power to detain accused terrorists and other criminals in the United States remains unresolved.